Regular: $229.95 - $234.95 Save 35%! Regular: $277.95 - $338.95 Save 35%! Add Road Hazard Tire Protection? With all this technology coming out for bikes these days you’d think someone would come out with a performance tire made for wet conditions. Well, let me introduce the Michelin Road 5 Motorcycle Tire. Specifically made to handle wet conditions for its entire life. Actually the tire performs better as it get more miles on it. Ok, so the tread design is awesome, but what about the casing of the tire, what gives it that tire shape? Michelin has developed what they call Adaptive Casing Technology or ACT +. The casing on this responses the riders demands better than any other tire on the market. Check out all the features Michelin Road 5 Motorcycle Tire has to offer listed below. We're putting the spotlight on Michelin tires. See what we have to say about them. Only on it for 100 miles so far but feels like glue on the road, smooth ride. Installed the set of tires on my R1200RT. I have only put 100 miles on them. The bike handles great, will report again when I get more miles on them. Nice sticky tire. I installed it on a 2008 BMW R1200RT. Way better than the last version, the Road 4. 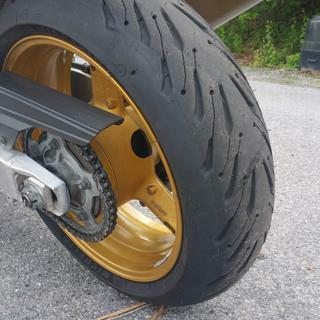 Great tires, I replaced a set of Bridgestone Battlax tires with the Michelin Pilot 5. They appear to be a good wet weather tire, as well as dry. I love these tires. I have had sets of Michelin Pilot Road 3s, 4s and 4GTs on my Yamaha FJR1300. 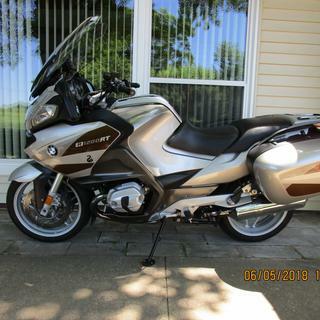 So when I traded the FJR in for a new K1600GTL and saw that it had Bridgestone BattleAxs on it i knew I would be looking to replace them with Road 5s. After riding on the BattleAxs for 300 miles I didn't like the ride and didn't have the same confidence in them to hold the road in curves as I do in the Michelin Road series of tires so I made the change at 320 miles and I could not be happier. Good feed back, I could tell a big difference in handling and feel right a way. Love taking the curves at speed with these tires. I have not been caught out in the rain or ridden on wet pavement yet, but I have full confidence in these tires on dry payment. And most likely be just as impressed with them in the rain. Michelin tires have been my favorite since 2009. I love these Michelin Road 5's. Haven't installed them yet. If they are as good as the Road 3 tires they will be great. enjoy the new Michelins. great choice and great price, I would do the order again. It was a positive purchase experience. The Michelin road 5 Are a great tires. There on 2009 BMW k 1300 gt .the right tire for the bike. I ride a 2017 Kawasaki ZX1000. I bought it brand new with Battlax tires on it. I bought my bike from a dealership approximately 100 miles from where I live. When I rode my bike home from the dealership, I was concerned I had made a mistake. The bike handled terribly. My second ride on my new bike was a little more enlightening. It was clear it was the tires. I felt like they were fighting me every step of the way... I couldn't wait to get those tires off my new bike. I bought Michelin Road 5's. My very first ride on the 5's was a huge difference. From the start, the tires handled so much better. After breaking in the tires and breaking in my new engine, I went on a real ride. Oh LORDY!!!!! I was in love! The bike is a superb machine and with the right tires on it, it takes canyon carving to a whole new level. I currently have 7500 miles on my Road 5's. The front (which is made from a slightly softer compound than the rear) is starting to show signs of wear, but the rear has lots of life left. I've never got this kind of mileage from tires before. I highly recommend them. I'll be buying my second set of Road 5's sometime this year, I'm sure. The Michelin Road 5 is an excellent tire. I now have over 8,000 miles with still plenty of tread left. These tires handle fantastic in both wet and dry conditions. They are much grippier (is that even a word? )...anyway, you know what I am saying...than the Pilot Road 4's. Looking forward to the GT version but I will continue to run these until the GT's become available. Michelin, you have a true winner with this tire! Bike Bandit, you guys have the best prices around, thank you! The Michelin Road 5 is beyond my expectations. I consider my tires one of the most important safety features that I utilize and if your looking for handling, stopping power and agility, then you might want to strongly consider what Michelin is offering in this series. Dry, wet, it's awesome. Got almost 6k miles out of the pr4 rear, should be the same with the 5. Went to the local bike shop to install. The Yamaha dealer would not install tires bought from anyone but them. Their loss. I now have a local shop that does all I need. Tires handle very nicely. Work really good in the rain when sharp cornering. 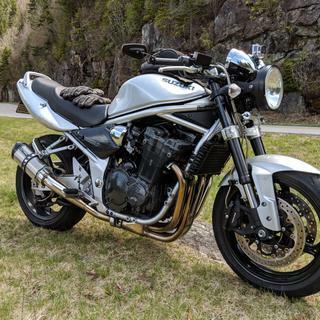 I have a modified 2000 Suzuki Bandit and just returned from a trip down to the Smokies area. I put 900 miles on these PR5's and couldn't be happier with my choice. I used the whole tire (no chicken strips left). The traction cornering and braking was superb. I haven't ridden any wet roads yet but expect they will work great there too. My past experience with traction and longevity of PR2's led me to this purchase. I considered Dunlop Q3's (great tires) but wanted a tire that lasts more than a season. 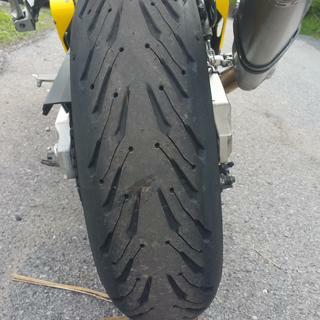 These Michelin Road 5 motorcycle tires made my 2015 Suzuki GSXS 750 100% better than the O.E.M tires. I now ride with the ultimate confidence that all riders should. Smooth...I mean silky smooth...great grip and so far no wear at all. You can't go wrong with these grippers! So far they are very smooth running tires. Can't say much other than that. I recently purchased a set of Michelin Road 5 Tires for my Honda CB 600F which had a set of five year old Continentals on it. They were in very good shape because I don't ride hard and the bike is always kept indoors. Always had them checked by my bike mechanic Brian Davis of ESG Kustoms in Mcallen, Texas. I found the best price at Bike Bandit and spoke with a gentleman named Travis who was very knowledgeable and helpful. I had originally opted for MIchelin Pilot Road 4s but since these were a much better tire and only eleven dollars more decided to go with them. At first I could tell no difference from the Continentals but within a hundred miles or so, their superiority became apparent. They hold the road extremely well, the ride improves every time I take the bike out, cornering is a non-issue, and high speed (100 mph plus) presents no problem at all. I would highly recommend this tire to anyone. I chose them for safety and performance and they meet and exceed my expectations. These tire are so perfectly balanced that after balancing the rims no weight were needed after mounting the tires. No specific mounting alignment was used on either tire. Tried all kinds of tires and the Michelin Pilot Road series are far and away the best for street, dry or wet. I buy Michelin because I ride in the rain and they are great wet weather tires. Great reviews, especially high ratings on treadwear and wet traction. Going on my Suzuki SFV 650 which is obviously more of a sporty commuter rather than a track toy. Best tire per owners group reviews. Best price per internet searching. Always buy Michelin. Always happy. I've had great results and longevity with this brand of tire and am confident I will enjoy this line as much as I have the previous styles. I ran the Road 4 for 15k and they were great! It was Easy to chose these! i currently run road 4 gt on my 2013 r1200rt they have worked great riding two up and as a daily commuter the road 5 looks even better. 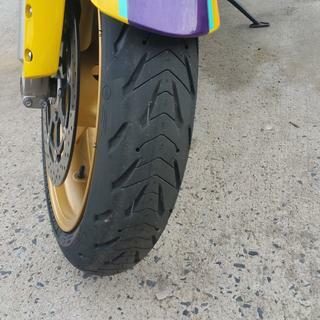 Watched the RevZilla review on this specific tire. I liked how they are supposed to handle in the rain so I decided since the weather up here in VT is so unpredictable I might as well get tires that can handle wet roads well. old rear tire worn out. Reading different reviews...most say these are the best sport touring tires on the market. I currently have pilot 3 on my busa and have been absolutely pleased with their performance. Looking forward to trying these new tires out. Pilot road series is the best series tire hands down no matter how you ride or where you ride. unbeatable! The size was not available in other Michelin ST tires. And I have used Michelin for about 50k miles on my R1100RT. Hoping this newer one will be even better. This bike does wear the front tire on the left side long before fhe right side - at least 20% difference. Over the past 12 years and 280,000 plus miles ridden on 2 Yamaha-FJR's between Weekend crazy riding in the canyons and 4 day vacation rides plus commuting to work everyday. I have run every brand available. The Michelin tires stick better and last longer then all the rest. Highly recommended in online forums -- all owners seem to be pleased with these tires! I bought these tires because of the technical design quality and rave reviews from other riders. Need new tires that perform well and stick to the road. Michelin always last longer and has the best quality tire. I don't take chances with parts on my bike, I always buy the best. Michelin road 5’s are the best sport tires on the the market for my style of riding!! I had PR4's and saw great reviews for these. Have Road 4"s on other bike and they are amazing, all weather and all paved road surfaces, wet, dry, cold or hot they ate up everything. Great grip in wet through heavy construction areas with changing surface dust and isolated gravel deposits!!! Good reviews and Mich. reputation. I've never used Michelin before. Seeing if there is a difference between Dunlop RS 3.
rode a friends bike that just had these put on and they were awesome. i have not ridden with them on my bike (07 FZ6) yet. I've been very happy with Michelin Pilot Road 2's in the past. The Road 4's have a very good reputation. The initial reviews on the Road 5's seem pretty good. I want a tire designed for wet/dry traction. Michelin's also wear well, last a long time and provide plenty of grip. The Road 5 has a new tread pattern that looks like it will maybe eliminate the scalloping issues of the Road 4 when used in the rear on a high performance sport bike. These Road series tires stick as well as most sport tires with about twice the wear difference. I use a Road series rear and any sport front like a Q3 or S21. The Road series is fine on the front too, and would be a better choice if riding in rain. New wet weather compound on top of the reliability of the Road 4, what could be better, and they are on sale. Does Michelin make this pilot road 5 in a GT version for heavier touring bikes like they do with the road 4? BEST ANSWER: Good question, and one I asked when I recently bought a set of Road 5s for my 2003 BMW K1200RS as suggested by the Michelin web-site. According to Michelin there will be a Road 5 GT released sometime this year, but to the best of my knowledge a definite release date has not been announced; check the Michelin website for any updates. The other unanswered question regarding the choice between the Road 5 and Road 5 GT is where Michelin is setting the weight point for determining which tire to fit to your machine. I never could get an answer to this one from Michelin. FYI- the Max GVW for my bike is 1100lbs (440f/730r); I have ~2k miles on the Road 5s so far, mostly hi-speed highway miles one-up with luggage/camping gear, and I have not experienced anything at all to indicate that I need a heavier tire. Turn in is predictable and consistent and the sidewalls only talk to me at appropriate moments. If I have any complaint with the Road 5s it's that they seem to me to be a bit slow coming up to temperature, but, in all fairness, once the tires are at temp they are very ride-able and transition from the center to the edge very smoothly. As always, tire choice is probably the most subjective part of judging a motorcycles performance... no two riders will get identical results. If you have any doubt at all, wait for the GTs. , A slightly heavier carcass and sidewall won't significantly diminish the ride quality of your machine and you can be confident that if you have erred it's on the side of caution, and that's never a mistake. Not yet...Michelin is supposed to be releasing the GT version next year (2019). I can tell you that I have been running the Road 5 tires on my BMW R1200RT. In spite of it being a GT version, these tires are performing extremely well! I have over 8,000 miles on them with still plenty of tread left. If I can manage to make it through the rest of the Summer, I will be more than pleased! The Road 5's are very "grippy" and they handle very well in both wet and dry conditions. This is now my GO TO tire. I used to run the Pilot Road 4's and I can tell you with absolute certainty, these are truly a better tire. I hope this helps! Be safe! Thank you for your question. No sorry Michelin does not made the GT version for touring bikes at this moment. Please let us know if there is anything else we can do for you by contacting us by email at [email protected], Live Chat or by phone toll free at 1-888-339-3888. We are always more than happy to help. I may be wrong but from my understanding it is not needed as the PR5 has different layers of rubber compound starting about 1/2 out the tread and extends to the sidewall that are stiffer much like the PR4GT. The pilot road 4 had a stiffer sidewall option available for heavier sport tourers like the FJR. Does the Road 5 come in two versions also?